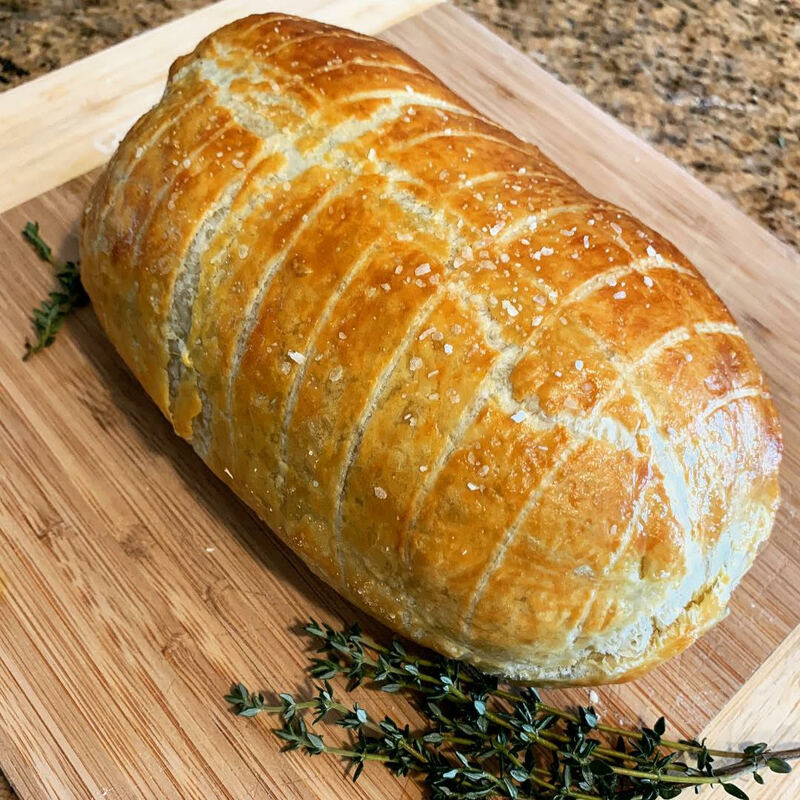 After years of watching Gordon Ramsay cook and rave about the famous Beef Wellington, we decided it was finally time to give it a try. 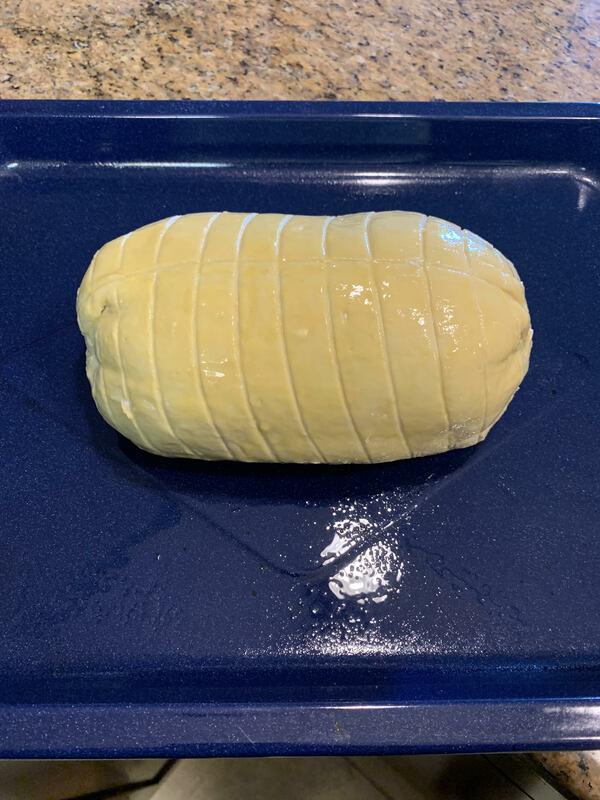 Of course that meant using the Anova to make the perfect medium rare beef tenderloin so we could put our attention and focus on the rest of what makes up the Wellington. Season the beef tenderloin with salt and pepper and cook it in the sous vide bath for 2 hours either in a vacuum sealed bag or by using the water displacement method. To make the mushroom duxelles: Melt butter in a pan over medium-high heat and fry up the chopped mushrooms, garlic, and thyme leaves. Continue to cook until all the excess moisture is released about 10-15 mins. Mushrooms hold a lot of moisture! Once done, remove from the heat and allow to cool. Lay out a large layer of plastic wrap. On top of that, spread out a layer of Prosciutto slices, allowing each slice to overlap each other. 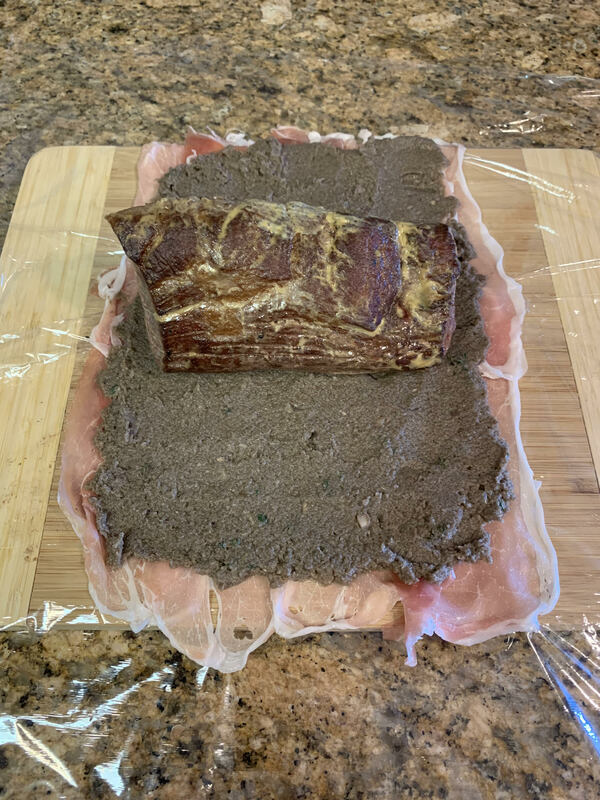 Spread an even layer of the cooled mushroom duxelles across the prosciutto slices. In the middle of the entire prosciutto-duxelle layer, place your beef tenderloin. 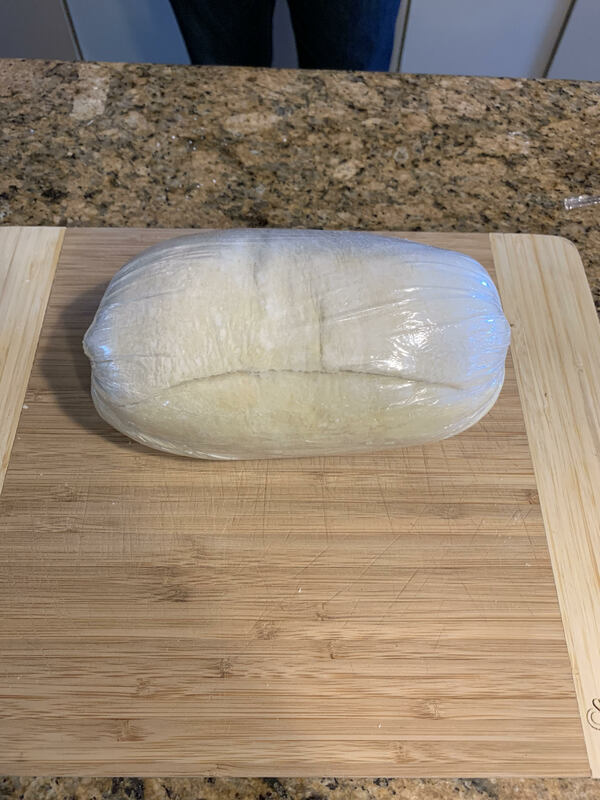 Carefully wrap the entire prosciutto-duxelle layer using the plastic wrap to roll it over. Twist the ends of the plastic tip to keep it tight. Place it in the fridge for 30 mins. Lay out another layer of plastic wrap on the counter. Lay out the uncooked pastry sheet in the middle of the plastic. Remove the tenderloin from the fridge and unwrap it from the plastic. 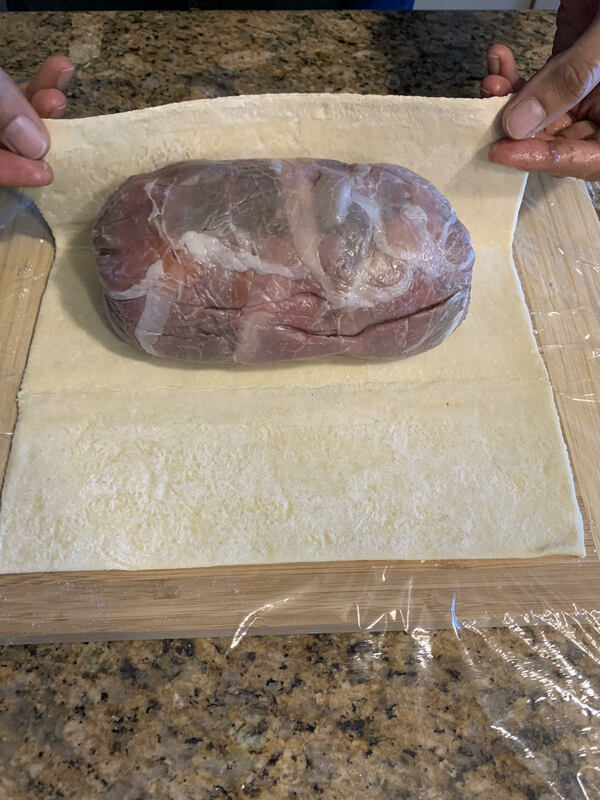 Place the firm prosciutto wrapped tenderloin in the middle of the pastry sheet. Wrap the pastry sheet around the tenderloin in a similar fashion as the last step. Twist the ends of the plastic tips tight. Again, place it in the fridge for another 30 mins. Using a sharp knife, score the outside of the puff pastry in any type of design you'd like. This is optional and only for an aesthetic finish. Place the beef wellington on a oven safe pan and cook it in the oven for 20 mins to cook the puff pastry to a golden brown. Remove from the oven. Allow the Wellington to cool for 15 mins. Slice and enjoy!